After a three-year overhaul and major upgrade, the United States’ deepest-diving research submersible, Alvin, has been cleared to return to work exploring the ocean’s depths. The sub has been out of service since December 2010, undergoing a major upgrade that included the replacement of its personnel sphere with a newly fabricated, larger, more capable hull. 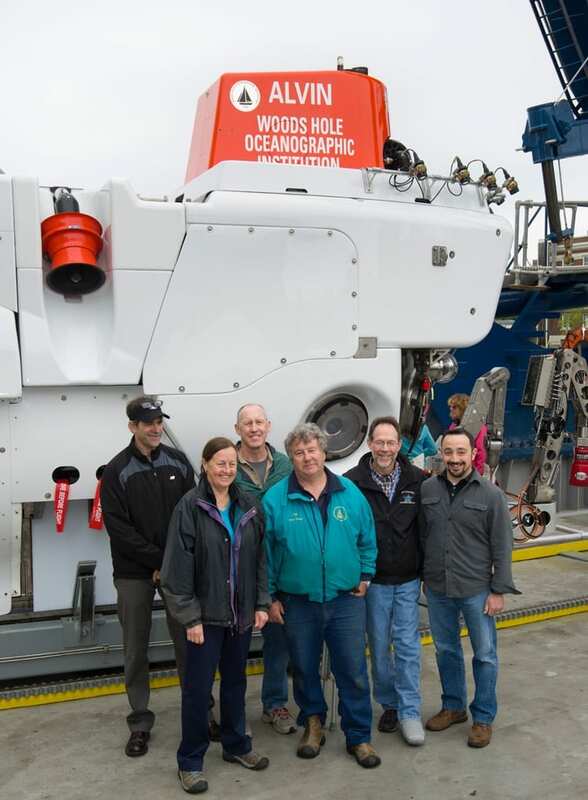 The Woods Hole Oceanographic Institution (WHOI) operates the Navy-owned sub for the National Deep Submergence Facility (NDSF) on behalf of a consortium of universities and research organizations conducting deep ocean research (UNOLS). On January 8, 2014, the Naval Sea Systems Command (NAVSEA), Executive Director of Undersea Warfare for the Department of the Navy, Steven Schulze, certified that the sub could safely operate to depths of 3800 meters, with the expectation that a certification dive to 4500 meters will be completed later this year. Alvin carries a pilot and two science observers on missions that last approximately eight hours. Certification was the final step in Stage I of the Alvin upgrade project, funded by the National Science Foundation and WHOI. The project included upgrades to major components to the increased depth rating of 6500 meters, including installation of a new, larger personnel sphere with improved interior ergonomics; five viewports (instead of the previous three) to improve visibility and provide overlapping fields of view; new lighting and high-definition imaging systems; new syntactic foam providing buoyancy; and an improved command-and-control system. Upgrades also included improvements to Alvin’s launch system and storage hangar on board its support vessel, the R/V Atlantis. 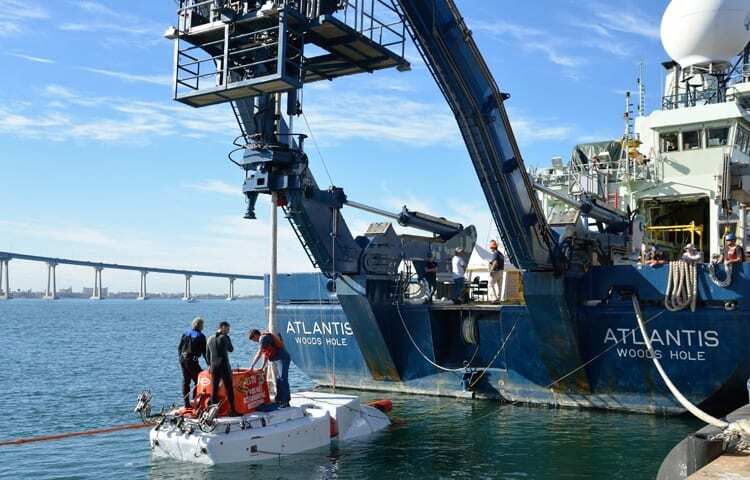 The Navy certified Alvin using its Deep Submergence Scope of Certification (DSSOC) process, reviewing the design, construction, and materials used to ensure the vehicle performs as expected. The Navy uses the same processes to certify manned undersea systems for submarine rescue and submarine-based Special Operation Forces delivery systems. “The successful partnership between NSF, Navy and WHOI ensures that researchers will continue to have direct access to the deep ocean for the next generation of scientists and scientific challenges,” said Bob Houtman, section head in NSF’s Division of Ocean Sciences. Alvin will be put into service in mid-March for a “science verification” cruise led by Peter Girguis of Harvard University, who is chair of UNOLS’ Deep Submergence Science Committee, tasked with oversight of the NDSF. Girguis, along with a team of scientists from across the U.S., will test the various data acquisition and sampling systems in and around a combination of cold seep and deep-water coral sites in the northern Gulf of Mexico, between New Orleans and Gulfport, Mississippi. The scientists onboard will provide others in the research community with their written descriptions and assessments of the sub’s performance. Following that expedition, Alvin is scheduled to conduct three research expeditions in the Gulf of Mexico, examining the impacts of the Deepwater Horizon oil spill, determining the effects of ocean acidification on deep-water corals, and studying deep water seeps. During the second half of 2014, Alvin will be on the U.S. West Coast, for dives on Juan De Fuca Ridge and later at the East Pacific Rise and Dorado Outcrop off Costa Rica. Last November, the Alvin operations team, along with observers from the U.S. Navy, conducted certification dives off San Diego, Calif., where the sub was taken to progressively greater depths to prove that all of its systems are safe for operation. While Alvin is capable of operating to depths of 4500 meters, time and location constraints during the certification trials prohibited dives to those depths. Later this year, WHOI, NSF, and the Office of Naval Research will schedule a dive to 4500 meters to achieve the maximum certified depth of 4500 meters for Stage I. The current Alvin certification depth supports all planned science activities in 2014. Stage II of the upgrade is dependent on funding and improvements to lithium-ion battery technology. That stage will bring the remaining systems (i.e. battery, variable ballast, and hydraulics) to the 6500-meter capability, and the sub will then be certified to that depth. This year marks Alvin’s 50th year in operation. 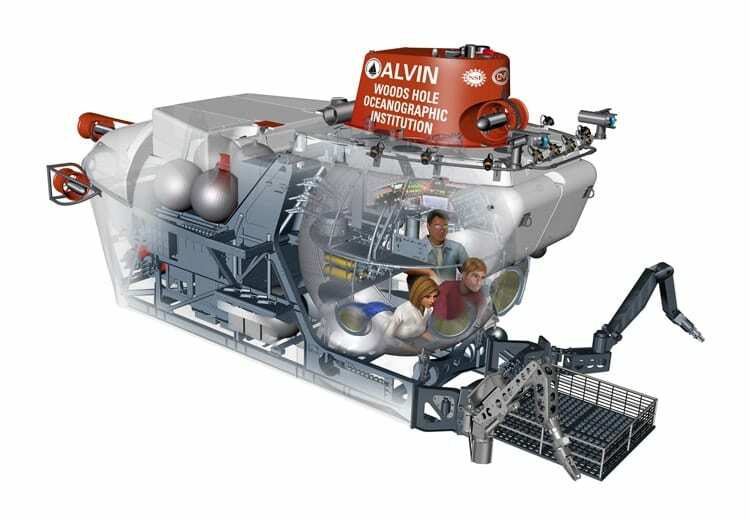 Commissioned in 1964 as one of the world’s first deep-ocean submersibles, Alvin has made more than 4,600 dives. The sub has undergone many upgrades over the years, including replacement of its steel personnel sphere in 1973 with one made of titanium, enabling access to a greater percentage of the seafloor. The sub’s most famous exploits include locating a lost hydrogen bomb in the Mediterranean Sea in 1966, exploring the first known hydrothermal vent sites in the 1970s, and surveying the wreck of RMS Titanic in 1986. In addition, the sub has enabled dozens of new discoveries and countless insights into the way deep-sea geology, chemistry, and biology function independently and interact as part of Earth’s overall planetary system. The $41 million Alvin upgrade was a complex project, involving a number of WHOI personnel to manage different aspects of the program. Posed in front of the newly completed sub in May 2013 from left to right are: Bruce Strickrott, Alvin Expedition Leader, who oversaw the operations group and technicians; Susan Humphris, project principal investigator, Kurt Uetz, Alvin upgrade project manager; Pat Hickey, Alvin Operations Manager; Rob Munier, WHOI VP for Marine Facilities and Operations, and Anthony Tarantino, engineering manager and former Alvin pilot. Artist rendition of the newly upgraded HOV Alvin showing interior layout. Among other improvements to the sub, the new, larger personnel sphere has improved interior ergonomics and five viewports (instead of the previous three) to improve visibility and provide overlapping fields of view. HOV Alvin off the stern of its support vessel R/V Atlantis during sea trials in Nov. 2013 in San Diego, Calif.